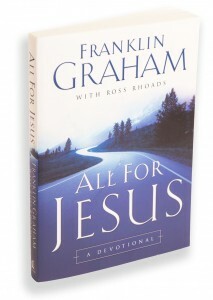 All For Jesus Franklin Graham, with the help of long-time friend Ross Rhoads, brings an encouraging collection of 30 devotions to inspire a life of faithful commitment to Jesus Christ. All for Jesus will help you develop the qualities of focused, whole-hearted discipleship and will show you the extraordinary results that are possible in a life lived solely to glorify the Lord. No matter how deep your regrets, you can open this book and begin to discover the limitless, life-changing consequences of living all for Jesus.